Pledge Thank You - ASK. LEARN. VOTE! Thank you for pledging to vote! Your voice matters and by pledging to vote you are already starting to make a difference in the issues that matter most to you. That being said, there are a few steps to take before you cast a ballot. 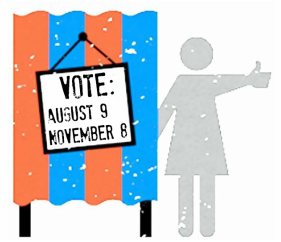 ​Voting is an indispensable part of being an advocate for Wisconsin women. Our elected leaders are making decisions every day that affect our lives and well-being. By voting and making our vote count, we can ensure that legislative leaders focus on the values and priorities of women and families throughout our state. Are you a registered voter? Find out! ​There are two elections left in 2018- August 14th and November 6th. Add both dates to your calendar. ​Do you know where to go on Election Day? Link here to find out! As a Wisconsin voter, you have a lot of options. However, photo ID is not one of them. Every voter is REQUIRED to show photo ID upon casting a ballot. Do you have a valid form of photo ID? Are you a college or university student? Have you heard about the FREE state ID card? Are you planning on voting absentee? Get a headstart on what you'll need to bring to the polls by linking here. And finally, tell your friends! Tell everyone that you're ready to vote and encourage five friends to take the pledge!